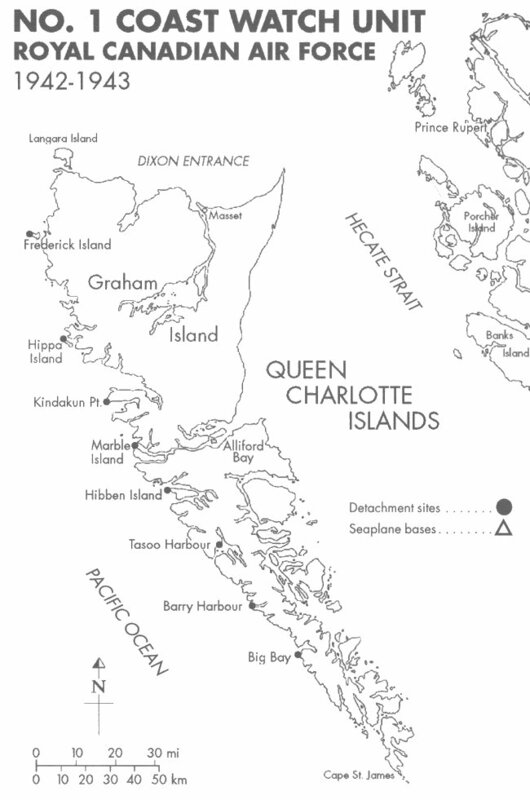 On 27 February 1942, Air Vice-Marshal LF Stevenson, in a letter to Air Force Headquarters in Ottawa, outlined a plan to temporarily fill in the gaps in the defence organization on the west coast of the Queen Charlotte Islands. He proposed a Coast Watch Unit of ten small detachments which would act as an "early-warning system" until radar stations could be provided in sufficient numbers to give full coverage. The government lighthouses at Cape St. James and Langara Islands completed the coverage of the most vulnerable areas of the British Columbia coast. Clicking on a site name will bring up additional detail. RCAF Station Alliford Bay was the closest supply base, and a Flight Sergeant at the Station coordinated the resupply and other requirements of the detachments. 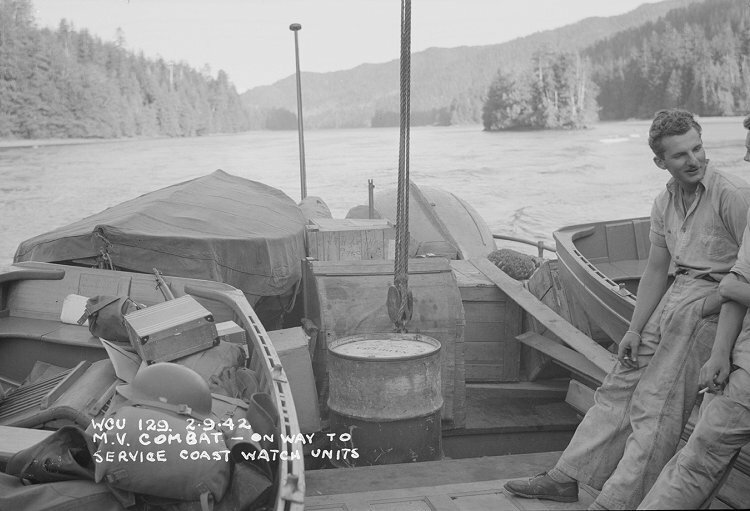 They were issued with an outboard motor boat, camping gear, and all the necessary equipment to operate a bush-camp. A two-way radio set allowed them to communicate with the Station at Alliford Bay, and all reports went directly to the Commanding Officer, who had over-all control of No. 1 Coast Watch Unit. The detachments set up their camps on high ground at the chosen vantage points along the coast. The search for personnel to carry out the Coast Watch project centered on Airmen with previous bush experience, who were familiar with survival methods and first aid. The men would need to rely on each other and work as a team as they faced the extremes of climate in the Queen Charlottes. Four Airmen manned each camp; one competent woodsman, two radio operators, and one general duties airman to maintain the quarters at the camp and do the cooking. These detachments were an unqualified success and provided the anticipated "gap coverage" for a year and a half until the Radar Units on the Queen Charlotte Islands were fully operational. By 22 November 1943, Western Air Command began to disband No. 1 Coast Watch Unit. All detachments were disbanded by 19 December 1943. Life at the coast watch camps was generally uneventful, except for the challenges provided by the atrocious weather and lack of any facilities. However, one returning airman, when questioned about his remote duty in the bush replied: "We spent the whole wartime there; never saw a thing to report; had a fine camping holiday - with pay". 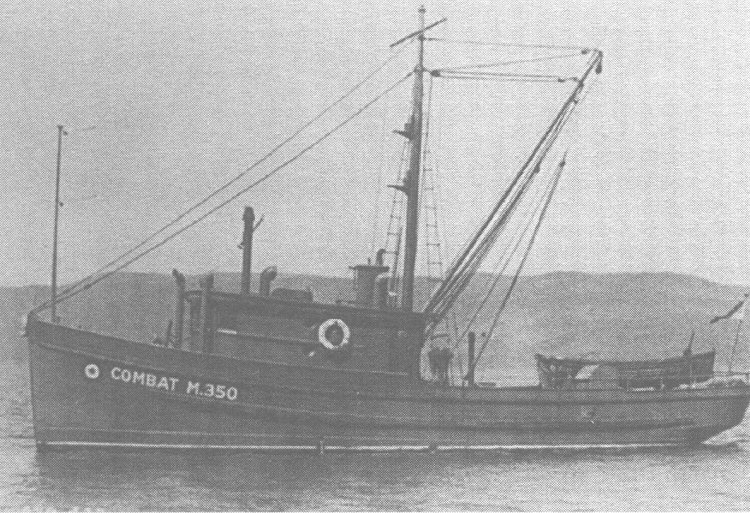 The M/V Combat (M-350) functioned as a supply ship - 2 September 1942. Side view of the M/V Combat (M-350) - September 1942.